Yes, it was a good Christmas. We kicked it off with a killer breakfast – pancakes, eggs, ham, and sausage for the omnis; tofu, green pepper, red onion, and Soyrizo scramble for me; biscuits and berry salad for all. It was lovely. While the coffee warmed our souls and awakened our senses, the unwrapping commenced. The kiddos scored games, hubby scored Stephen King books, and the dogs scored bones. I scored cookbooks! :squee: While cookbooks may not appeal to all, they make me giddy. Be on the lookout for post and pics from The 30 Minute Vegan’s Taste of the East, Appetite for Reduction, and Viva Vegan in addition to goodies from Everyday Happy Herbivore, meals and snacks from Tess Challis‘ books, and whatever inspires me that day. Today’s inspiration is due to the rainy weather outside. Bright colors are required, so Mexican will be on the dinner plate. I have lots of love for Happy Herbivore. I can’t remember when or how I first stumbled across Lindsay Nixon’s blog, but I have been drooling over and cooking from it ever since. The omni family has loved most of her goodies, too. 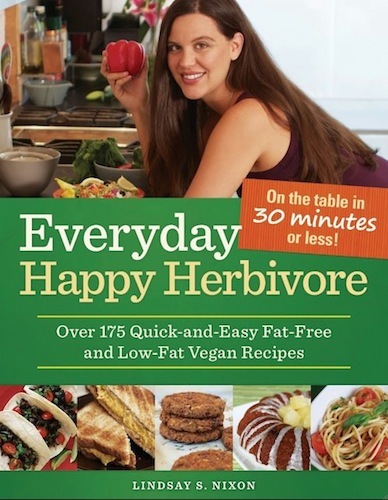 I have a well worn copy of The Happy Herbivore Cookbook and received my copy of Everyday Happy Herbivore a couple of weeks ago. I’m digging it, too. When Lindsay put out a call for stops on her blog tour, I jumped at the chance to pick her brain a little. Me: You’ve mentioned Charleston in both of your books. How much did the Lowcountry inspire your cooking? Were you introduced to many new ingredients or techniques? 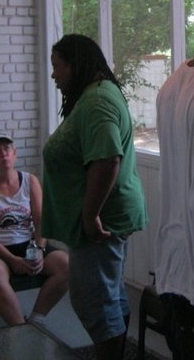 Lindsay: I lived in Charleston, SC for four years to attend the College of Charleston (c/o 2004). My husband is a graduate of The Citadel (Hotel, 2000) and he was also raised in Summerville, South Carolina. I have a soft spot for Low Country cuisine — and cajun, too. They’re magnificent and really understand the concept of sticking to the basics, using hot spices and fresh, local foods to make something amazing. Was it difficult it find a variety of vegan eats when dining out? In Charleston? No. 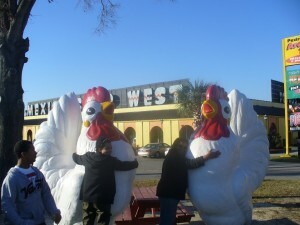 I was actually pleasantly surprised when we went back to visit last November (2010). I contacted the Charleston Vegetarian Group on Facebook before I went for some restaurant recommendations, but some of our friends wanted to go to other places, and I admit I was worried I’d be limited to salads. Boy was I wrong! Every restaurant we went to had something on the menu that was already vegan (not necessarily identified as such — but no dairy, meat, etc) or something that could be made vegan if we left off cheese. I thought FOR SURE when Scott’s friends made us go to Wild Wings I’d starve and I actually had a really delicious meal there! 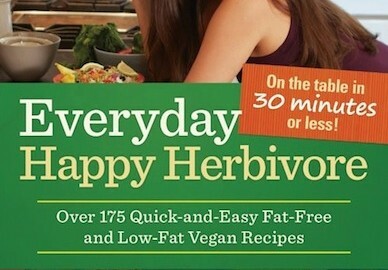 In Everyday Happy Herbivore, most of the items can be on the table in 30 minutes or less. Are there any other quick cooking tips that work for you? I can’t stress the importance of a well stocked pantry and spice rack — that is the secret to fast cooking. We’ve all had kitchen failures. My most recent involved misreading a recipe and adding 1/2 cup of agave nectar instead of 1/s TBS to bread. What was your most memorable kitchen fail? I once turned my blender on without the top on. Green smoothie EVERYWHERE. Seitan also blew up once and splattered on the wall and ceiling. That was awesome. Desserts are always a safe bet — but I try NOT to bring a vegetable side or a soup because I want to dispel the notion that we only eat the side dish or vegetables only compliment meat. I like to show off how beans and vegetables ARE the meal and not just a side. BUT it’s important to do whats right for your situation — we all know our family and friends pretty well and that can help us decide what to bring. When in doubt, Cake. While cake helped bring my family on to the herbie train, burgers and fries keep them coming back time and again. 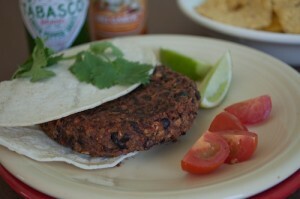 Lindsay shared one of her burger recipes from EHH. Not only is it quick and easy, it’s pretty cheap, too. This would make a great quick lunch or dinner on a crazy night. I developed these burgers in a hotel room: they’re quick, easy and require very few ingredients. (In fact, except for the beans and a seasoning packet, I sourced all the ingredients from the complimentary “breakfast bar”). I make these burgers any time I need a super fast meal or I’m really low on ingredients. Preheat oven to 400F. Grease a cookie sheet or line with parchment paper and set aside. In a mixing bowl, mash black beans with a fork until mostly pureed but still some half beans and bean parts are left. Stir in condiments and spices until well combined. Then mix in oats. Divide into 4 equal portions and shape into thin patties with your hands. Bake for 7 minutes, carefully flip over and bake for another 7 minutes, or until crusty on the outside. Slap into a bun with extra condiments and eat! Chef’s note: If you only have rolled oats, chop them up in a food processor or blender so they are smaller and more like instant oats. Rolled oats left whole tend to make the burgers fall apart. Thanks again, Lindsay for the inspiration, tips, and fantastic food. Go Cougars! The big day is almost here! 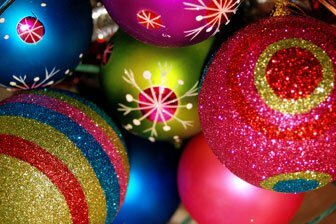 Well, our big days are almost here, Yule and Christmas. I’m sort of at a loss because I’m officially on winter break and won’t have an assignment due until January! W00T! I still have to work, but I have a backlog of articles and blog posts ready to roll. I planned ahead and it feels good. We decided to do a fab feast for Yule dinner and brunch for Christmas morning. The kitchen will be busy this week and I plan to cook some things ahead of time. Instead of a table full of the usual heavy, fattier fare, there will be a mix. Unfortunately, the final menus are still up in the air. Greens, acorn squash, broccoli, rice, and bake (hubby’s request), and cornbread will be on the table Thursday night, but I’m not sure what else. The family will want meat (meh), and I want a centerpiece of sorts. I’m thinking seitan pot roast surrounded by roasted veggies. I’m torn between the versions in Vegan Diner and Vegan Lunch Box. For Christmas brunch, it’s on! Pancakes, sausage (homemade vegan patties), roasted potatoes and onions, broccoli quiche (vegan), and fruit are going on the table for sure. Again, the omnis will want meat of some kind, and hubby can cook it. I won’t. Regardless of what we eat as the main dish, we will have a lot of produce to choose from. And we’ll be together. That’s all we really want, isn’t it, to be with loved ones. It doesn’t matter if they’re related by blood, marriage, or in spirit, family can be bliss. And now it’s time to get in a walk. Peace, all.